Chip L298N (ST NEW). Using large capacity filter capacitor,this module can follow current to protect diodes,and improve the reliability. Double H bridge drive. Drive current 2A(MAX single bridge). Storage temperature -20 to 135. PWM frequency: 3 kHz. PWM Sampling rate: 0% -100%. 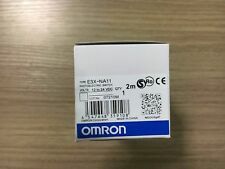 consumption: 0.01 400W. Light shooting and different displays may cause the color of the item in the picture a little different from the real thing. The A4988 interface is an ideal fit for applications where a complex microprocessor is unavailable or is overburdened. 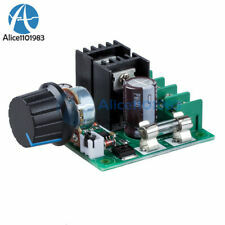 This stepper motor driver lets you to operate bipolar stepper motors in full-, half-, quarter-, eighth-. L298N as main chip, ST corporation production. Low heat,outstanding anti-interference performance. Chip: L298N (ST NEW). Can drive one 2-phase stepper motor, one 4-phase stepper motor or two DC motors. 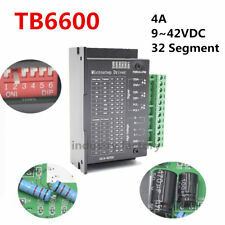 4A TB6600 Stepper Motor Driver Controller 9~42V TTL 16 Micro-Step CNC 1 Axis 2 or 4 Phase of Stepper Moto 42, 57, 86 Features : This drive is an upgraded version TB6600, the highest segments to 32, fit for high subdivision applications. Applicable stepper motor: 42,57,86 type 2 phase 4-phase (4-wire 6 wire line 8) 1, 9V-42V DC supply; 2, H-bridge bipolar constant phase flow driven; 3, eight output current optional, the maximum output current: 4.0A; 4, 6 subdivision modes available,up to 32 segmentse; . Maximum Power: 4000W (connected resistive load). The input is connected with AC 220V, output is connected to the electric stove wire or motor appliances. Load does not exceed the maximum power, otherwise it will burn module and electrical appliances;. Can drive 4 DC motors or 2 stepper motors or 2 Servo. - Up to 2 stepper motors (unipolar or bipolar) with single coil, double coil or interleaved stepping. - reset button. - 4 H-Bridges: per bridge provided 0.6A (1.2A peak current) with thermal protection, can run motors on 4.5V to 36V DC. 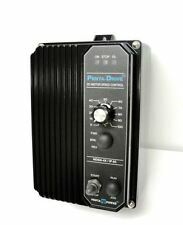 Specification: Brand new Working voltage: DC10V~50V Output voltage: Linearity Under Load Maximum current: 60A Persistent current: 40A Speed control range: 0%~100% Speed regulation method: Potentiometer (Tape Switch) Speed control type: regulating current Forward reversal: support Support motor: DC brush motor Feature: Fine workmanship and stable performance. Fast speed, high efficiency. Small in size, easy to carry. Convenient to use. Durable in use. Can drive 4 DC motors or 2 stepper motors or 2 Servo. 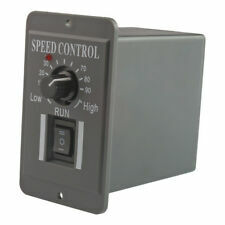 - Up to 2 stepper motors (unipolar or bipolar) with single coil, double coil or interleaved stepping. - reset button. - 4 H-Bridges: per bridge provides 0.6A (1.2A peak current) with thermal protection, can run motors on 4.5V to 36V DC. Suitable for hard brushless motor, brushless motor drive and other miniature 3-wire or 4-wire brushless motor without hall. Speed Range: 0% - 100%. Work Current: ≤1.2A. Detail Image. USA, Canada, United Kingdom, Austrilia, France, Germany, Spain, Ireland, Italy, Others. The DRV8825 stepper motor driver carrier is a breakout board for TI’s DRV8825 microstepping bipolar stepper motor driver. The DRV8825 features adjustable current limiting, overcurrent and overtemperature protection, and six microstep resolutions (down to 1/32-step). 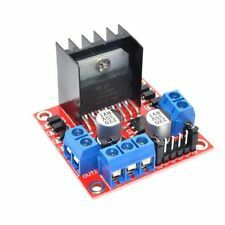 The EasyDriver is a simple to use stepper motor driver, compatible with anything that can output a digital 0 to 5V pulse (or 0 to 3.3V pulse if you solder SJ2 closed on the EasyDriver). EasyDriver drives bi-polar motors, and motors wired as bi-polar. Rated current: 40A ( Maximum Output Current ). Regulation Range: 5-100%. Frequency: 200Khz. Detail Image. Color: as picture shows. PWM Duty Cycle: 1% -100%. PWM Frequency: 10khz. L298N is main chip, it is Low heat,outstanding anti-interference performance. Chip: L298N (ST NEW). Can drive one 2-phase stepper motor, one 4-phase stepper motor or two DC motors. Double H bridge drive. Maximum power: 4000W (connected resistive load). 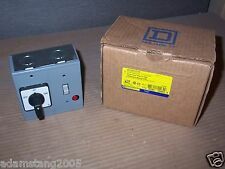 The input is connected with the AC 220V. Protection: anti-spike, Surge, RC absorption (EOC). Load does not exceed the maximum power, otherwise it will burn module and electrical appliances; use the resistive load as far as possible; reduce inductive and capacitive load power greatly. The DRV8825 stepper motor driver carrier is a breakout board for TI's DRV8825 microstepping bipolar stepper motor driver. 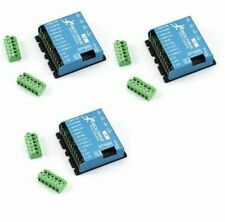 We also carry a DRV8824 stepper motor driver carrier that can serve as a direct substitute for the DRV8825 carrier when using lower-current stepper motors. Trending at C $8.73eBay determines this price through a machine-learned model of the product's sale prices within the last 90 days. Use of imported original chip, built-in low on-resistance MOS switch, minimal heat, no heat sink, small size, low power consumption, is ideal for battery powered. (L298N internal transistor switch, low efficiency, high fever, need to add heat sink, bulky, L298N very easy to burn). The STBY pin should be pulled high to take the motor out of standby mode. All pins of the TB6612FNG are broken out to two 0.1" pitch headers; the pins are arranged such that input pins are on one side and output pins are on the other. The maximum output power: 2000W. It can be very convenient adjust the current up to 25A, and solve the over current problem of the heating wire resistance is too small in the case of cooling causing good. 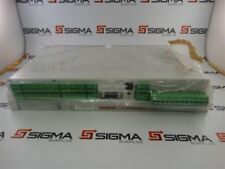 Applicable module: A4988, DRV8825. 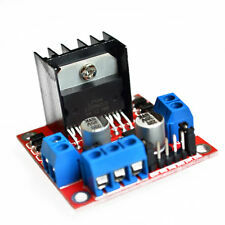 Suitable for 42 stepper motor drive, 3D printers and DIY. 1 x 42 Stepper Motor Drive Expansion Board. Size: 42 x 42 x 15mm. Interface: Direction, enable, speed. 4, can produce pulse signal, can also produce PWM signal, can choose the jumper. PUL=PULS=CLK Pulse. DIR=CW=CWW Direction. EN PUL DIR connect together to com 。. EN- connect EN. PUL- connect CLK. Setting up a board TDA1085C 80 80mm. Triac 26A. This circuit board can be used with any motor from the washing machine with tacho coil. The circuit board has the function of limiting the maximal motor speed to the desired level. PWM Duty Cycle:0 -100%. PWM Frequency:500KHz. High efficiency, high torque, high power, high heat dissipation. The high quality COMBICON improve the stability of circuit. Sustained current:3A,max.6A(Need to add a cooling fan when max. ). 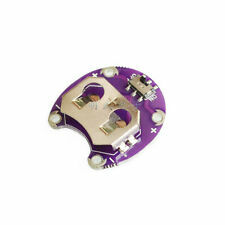 It is made with high quality circuit board which ensures a longer service life. PWM frequency: 21kHz. Maximum Current: 30A. Healthcare, Lab & Life Science. SPORT VELO ACCESSOIRES. Suitable for 12V motors with power less than 50W, 24V motors with power less than 350W, and 48V motors with power less than 500W. The driver board can drive hard disk brushless motors ,CD-ROM brushless motor and so on ， the micro 3-wire or 4-wire. without hall brushless motor . Speed adjust :0%-100%. Also note that monitor settings may vary from computer to computer and may distort actual colors. 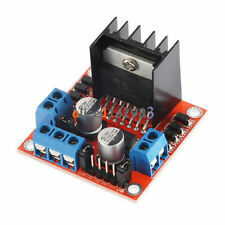 V3 Engraver Shield 3D Printer CNC Expansion Board A4988 Driver Board for Arduino. 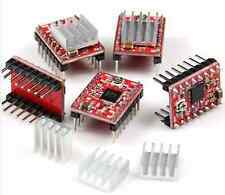 1 x V3 Engraver Shield 3D Printer CNC Expansion Board A4988 Driver Board for Arduino. It is worth noting that: in the patch A4988 module when careful not to plug in, stepper motor wiring is. PWM duty cycle: 1%-100%. PWM frequency: 20khz. · The DC motor governor input is DC, and it can't be directly connected to AC (for example: household 220V AC), otherwise it will burn out! · The motor can be positive or negative. 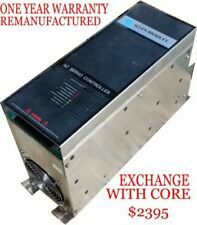 1.5KW 2HP 220V Single Phase Input To 3 Phase Output Variable Frequency Converter. Cases, Covers, Keyboard Folios. Audio Docks & Speakers. Humanized keyboard design, easy to operate. Digital display screen makes it convenient to read clearly. It supports various software and stepper motors. Probe interface: for Z axis tool zero. Laser interface: 12V or 5V, power less than 18W laser module. Communication: USB（USB-CH340）. 1x USB Cable. Stepper motor drivers are welded: A4988 motor driver,16 microstep 1.5A phase current output. TDA1085C - YouTube. Note: The entire circuit is not isolated from the mains! The relevant safety regulations must be observed. Universal single-phase motors can be found in many household appliances (washing machines ). 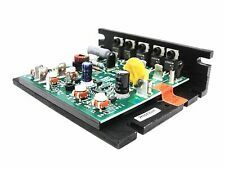 Input: DC 6~30V. PWM range: 10% ~ 95%. With reverse polarity protection, high current protection. Connect it to the motor, the motor line can be positive or negative, when the running direction is not consistent with the expectative one, you can adjust the sequence of lines or switch position to change the direction. 3 phase 60° or 120° brushless motor. Cruise(Optical):Cruise Function: Gray Cables(Two plugs connecting together will be auto cruise function;. -Three-speed;Anti-theft;EBS,Cruise. Phase Angle: self-study. ). The 5 line 4 phase can use ordinary ULN2003 chip driver, it can be connected into the 2 phase and. ULN2003 Stepper Motor Driver Module. 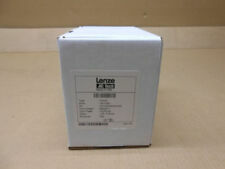 1 ULN2003 Stepper Motor Driver Module. DC 5V Stepper Motor 28BYJ-48. Normal mode 2: S1 forwards the start button, S2 reverses the start button, press any button to stop. If a limit stop is required, the upper limit switch can be connected to P3. [Power reverse connection protection] yes. 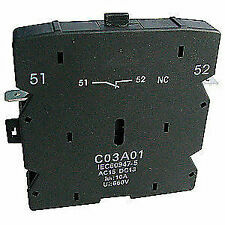 Continuous current 25A, instant 50A. Safe start, throttle position is incorrect, disable start. The speed limit, 2 pole turn up to 300000 rpm, 12. 50000, 14. 42000 pole. BEC output: Continuous 2A, (instant 3A).